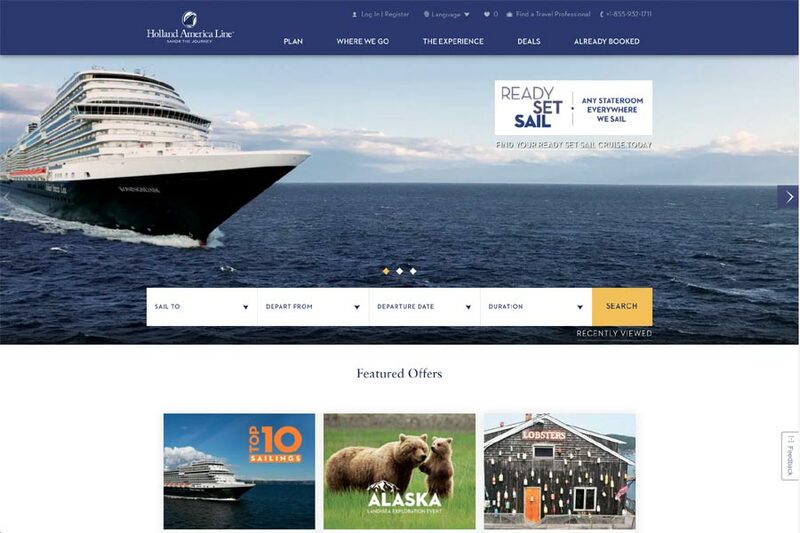 Holland America Line has just launched a shiny new website which makes it even easier to book cruises with clear navigation and a fresh modern look. Cruisers will find using the site a breeze as the cruise line brings the site up to date. There’s nothing better than experience a nice newly designed site to make the booking process for cruises even easier. Holland America Line has done just this by launching a new design which includes new elements for bookings and planning that dream cruise vacation. An important aspect is the home page, the first stop for most site visitors. Displaying vividly near the top is a new search bar where cruisers can efficiently start planning their cruise by choosing from sail date, departure port, departure date and the duration. Throughout the site, there’s also a new navigation bar at the top, new layouts and new area for special offers and featured destinations. Scrolling down the homepage, additional features include current promotions, select spotlight cruises and, initially for several weeks, a highlight video of the new website narrated by Ashford. Quick links go directly to the pages that provide information about Holland America Line’s award-winning service and classic-style cruising, details about the more than 470 ports of call on the cruise line’s carefully crafted itineraries, the onboard culinary experience, and enrichment activities and entertainment. EXC Tours can be searched by port and tour type.